The seasoned DXer has been in so many pileups that she knows the “usual patterns” that the DXpedition station uses to try to “thin out the herd” or spread out the callers so they can be heard (on Heard). This seasoned DXer gets in the log the first day the DX is on – and while the antenna is very important, (power less so) – operating skill is perhaps the most important part of the DXing equation. VK0EK WILL ALWAYS WORK SPLIT. NEVER SIMPLEX. (Split means they transmit on one frequency and receive on another that is usually a range of frequencies above or below where they are transmitting. Simplex means they would transmit and receive On The Same Frequency – and VK0EK will NEVER do this.) If you transmit on the same frequency – you will actually get yelled at and otherwise scorned by hundreds or thousands who are listening to the DXpeditions transmission – and they get angry when someone transmits on the DXpeditions frequency who is other than the Dxpedition operator. LISTEN. WATCH FOR THE OPERATORS “PATTERN” BEFORE YOU START CALLING. I always wondered exactly what all of the “usual” instructions are for DXers. They always say “Listen, Listen and Listen some more”. The problem with some of these articles, treatises and tomes is that they don’t tell you what to listen for exactly, and for how long. So – I will make an attempt to visually show you what to listen for – the DXpeditions operators pileup patterns. The quicker you can “get this”, the quicker you can get in the log. 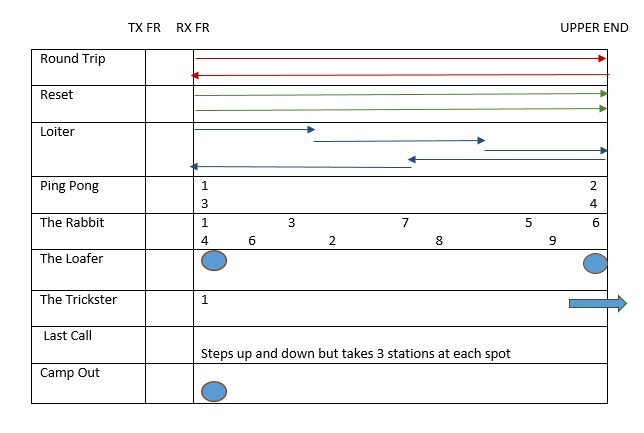 The “Round Trip” pattern is where the DXpedition operator goes up from the bottom frequency he is listening on and then slowly “walking” up to the top end of the frequency range. Then he comes back down. This is the classic and one of the most methodic methods. The “Reset” is where the operator goes from lowest frequency in her range to top end of her range, then “resets” back down to the lower end and climbs back up. Another very methodical and predictable pattern. The “Loiter” is a lot like the “Round Trip”, but the operator might decide to “linger” on each stop for several stations. The “Ping Pong” might have the operator jumping methodically between a low and high frequency in the range. The “Rabbit” hops all over the place and is totally unpredictable. The “Loafer” says they are listening in a range but goes back and forth between 2 frequencies and hangs out at each as long as they can still run the pileup. The “Trickster” might occasionally go above or below the range that the operator announces when they say something like “Up 5 – 15”. The “Last Call” is some variation on the Loiter. 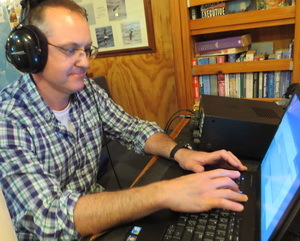 The “Camp Out” happens a lot on 40M SSB – where the DXpedition op targets a part of the world and sets a specific frequency – sometimes where say these two areas are not allowed on the specified frequency for that part of the world. This happens a lot where NA and JA’s have propagation and the op wants to separate these areas. So – the answer to the question of what to listen for is a PATTERN. And if you only spend 5 minutes just listening to the pileup before you start wailing away with your transmitter, the sooner you will get in the log. There are other patterns too – but this is all meant to give you an idea. There are certainly debates on what is best practice or not – but as a DXer, these are the ones I remember clearly. Good or bad – when I’m chasing the DXpedition – they call the shots and I have to follow their lead. Else – we step on each others toes and I get no Q. Another tip is if you are not sure the DX station has your call correct, don’t send just “599.” Send your call, then the report. This concludes my series on How to Get in the VK0EK Log, and I would love to hear if anything in this series has helped you – either while you prepare in these last days before VK0EK is on the air – or perhaps after you snag a Q with the team. Thank you very much , Rich! I feel a bit ‘exposed’ as often I am the only one giving comments, except for Kay, but just want to say that I enjoy the updates very much and eagerly watch out for the next one! Maybe it will sound silly, but thanks to these updates I feel that I am with the Team every inch of the way. Just as if I am a stowaway on the Braveheart, like Ol’ Dash 🙂 BTW: Did he show his face yet? The Braveheart is now on ‘short finals’ to Heard Island and can only wish the Team and Crew plain sailing on this stretch! My own reception of the WSPR Beacon is now beginning to fade, but it is so good to see increased activity from elsewhere. On the home front friend Ken, ZS6KN, at his quiet nature reserve (Onderstepoort) and with his 30m Beverage antenna, is still picking up those faint WSPRs from ZS9HI. It is good to see a major DXpedition publishing articles like this! I couldn’t agree more that operating knowledge and skill is the most important part of the DX equation. As part of a continuing effort to expose hams in my area to DXing and help them improve their success, I recently wrote a similar article. I am very closely following the updates and watching the satellite tracker. It is addicting! I reiterate that you (the entire team) are doing a fantastic job of making DXers at all levels feel connected to this expedition. I haven’t yet found the right combination of words to describe what this expedition means to me. It is not just another DXpedition. It will be my #330, but it is so much more than that. In many ways it will be the pinnacle of my DXing adventures to date. Correction: it already is! Perhaps in part because it has been inactive longer than any other entity. That certainly adds a level of excitement and anticipation. Perhaps because hearing VK0IR on 80 meters while living in a very limiting environment with a less than meager little piece of wire was a thrill – and marked a clear dividing line between relative innocence and a real sense of what rare entities and mega-DXpeditions are. More than any other event or bit of learning, that experience changed the direction of my ham radio journey, though it didn’t happen all at once. The seed was planted then, but it took time to grow and mature. If all of this is hard to put into words, the challenge pales in comparison to any attempt at conveying what ham radio and DXing has meant to my life. It has been a life filled with challenges; one in which ham radio and DXing has had a profound impact and continues to be a focal point for motivation, progress and self-realization. When I eventually find the right combination of words to paint a picture of what DXing – and in particular, this expedition – means to me, perhaps I will pass my story along. Meanwhile I will continue to follow along and go clean up the station in preparation for pouncing! Thanks Paul – we should have a beer at Visalia or Dayton sometime – DXing helped me through a rocky part of my life, and gave me a small “escape” – just enough for everything to come back around in the best ways possible. Beer required to divulge my story (just kidding). Rich, I would gladly buy you a beer with or without your story. I’m sure we could swap DX tales for hours. Unfortunately, attending either event would require personal assistance beyond any level that might be practically available. DXing is the window through which I watch the world. Excitement builds as I watch the Braveheart getting ever closer to Heard Island! Thank you so much for this “split patterns” that I read in such a clear way for the first time. I do believe it is very useful. It’s a great article, but I fear the folks who really need it would never be here before the operation even starts and reading things. They hear the DX and lose all conscious control, like a dog seeing a squirrel. Then they call on the DX’s transmit frequency. The fact that the DX is saying (or sending) “UP” means nothing to them. It can be really rough when you can’t hear both sides, so you can try to figure out the DX’s pattern. I spent most of my 40 years in ham radio drawn to DXing. I was drawn to it as a test of my station and me. Got 5BDXCC never running over 100 Watts and modest antennas before I got a linear. I got both VP8 operations last month but they were very weak here and it was quite a trial to get them. Great series on how to work DX in general and VK0EK. The review of pileup split patterns is a great tip. Tonight ZL/ZS9HI/MM was working a variation of “last call.” Strong signal at 0315z on 40 CW and hearing very well. Another tip is if you are not sure the DX station has your call correct, don’t send just “599.” Send your call, then the report. Be sure to hear your call come back OK. Best wishes to the team, especially fellow VHF enthusiast Arliss, W7XU. Agree 100% Jon – and I have updated Pt. 10 and gave you attribution for reminding me that this is important – it prevents busted calls since you need to hear your call come back.